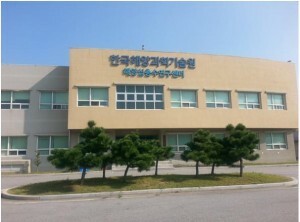 Deep Ocean Water Application Research Center (DOWARC) of the Maritime and Ocean Engineering Research Institute (MOERI) and Korea Institute of Ocean Science and Technology (KIOST) have completed to install a 20kW OTEC pilot plant in October 2013 and are going to have a public demonstration in November 2013 after trial run and basic performance test. DOWARC, MOERI has been working on a national project called ‘Development of utilization technology of deep ocean water energy’ since 2010. 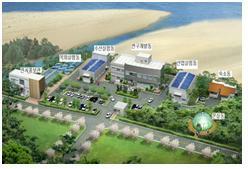 The final goal of the project is to obtain technologies to design a 1MW OTEC plant by 2016. 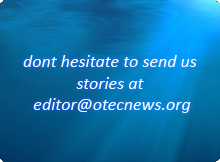 To achieve the goal, the OTEC team has successfully designed and made a 100W OTEC mock-up for trial performances test and public education in 2011. 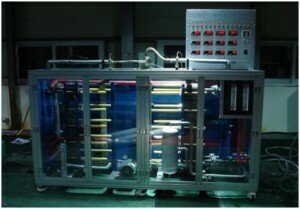 Conceptual designs of 1MW, 10MW and 100MW OTEC plants have been carried out from 2011 to 2012, and a 20kW OTEC pilot plant as down-scaled model was designed in detail by the Korean OTEC team which consists of 13 national institutes and universities by the end of 2012. After manufacturing the unit parts, all parts were gathered and fabricated in the early of October 2013.